• Our objective is to adhere to an adopted uniform policy that is conducive to providing an optimal learning environment with limited distractions and with consideration for safety and school identity. • The final decision regarding appropriate dress and grooming is left to the discretion of the school administration and teachers. • Clothing, hair and/or accessories should never be distracting in the classroom. • On certain days “dress uniform” is required. (i.e. School Mass, Grandparents’ Day, etc.) Students must wear long pants (boys and girls) or uniform skirts / jumpers / skorts / capris (girls), school sweatshirt (no tears or holes), sweater, or jacket. Shorts will not be worn on those days. The SMA logo is on all polo shirts purchased at Educational Outfitters. Every student must own/wear a uniform sweatshirt and/or uniform green jacket. Non-uniform jackets may not replace a sweater/sweatshirt. Heavier jackets may be worn only when cold weather warrants. Under-dresses (bike shorts) -solid color black, navy, dark green, “short” shorts required under jumper/skirt. Shorts may not show below hemline. 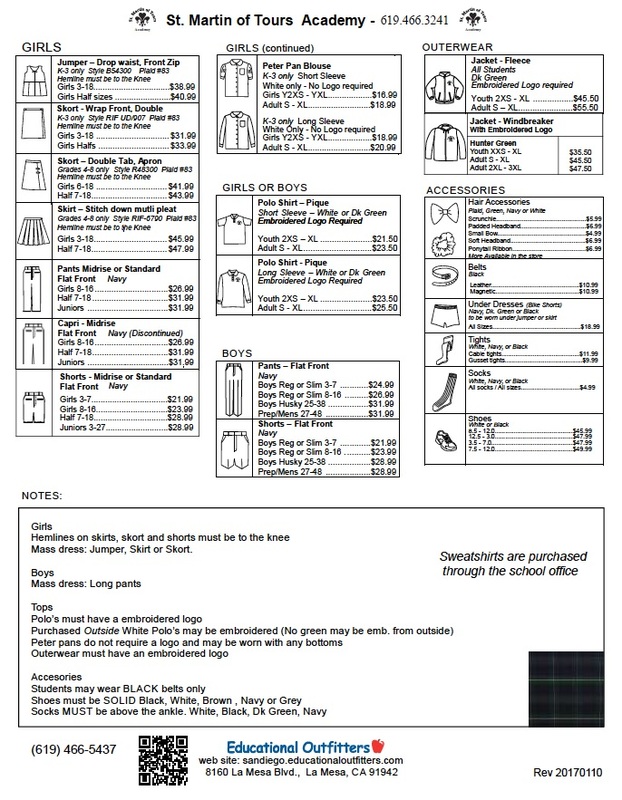 Alterations may not be made to the school uniform, such as shortening hemline on skirts or shorts. (Shorts and skirts may not be rolled up.) Hemline must be to the knee to allow for growth during the year. Boys pants must be regular fit. No oversized pants will be permitted. No tattoos and/or writing on skin. No excessive jewelry. Jewelry should be tasteful, not excessive, and appropriate for safe playground and P.E. activities (under discretion of teachers/administration). 1. Non-uniform jackets or sweatshirts, worn during the school day, will be held in the office. 3. In the event a student is in non-compliance with any of the above guidelines, parents will be called to correct the violation and/or the student will not be allowed to return to the classroom until the violation is corrected. “Free dress” will be allowed on certain, designated days. Clothing must be clean, modest, and appropriate for school wear. Please review guidelines below. These guidelines apply also to attire for after school classes, sports, and other school events. Shorts: only uniform or long, walking shorts may be worn. sandals, high/stacked heels, shoes without backstraps, etc. We ask the cooperation of parents in ensuring compliance with these guidelines before a student arrives at school on a “free dress” day or for a school event. 1. Parents will be called so that a change of clothes may be brought to school. 2. Student may not return to classroom until in compliance with dress code. 3. Student may lose the privilege of “free dress” on the next day(s) it is allowed.